Lists the technology categories integrated with or imported into Enterprise Architect, which provide Model Patterns specific to the technology. A Technology can have one or more categories. 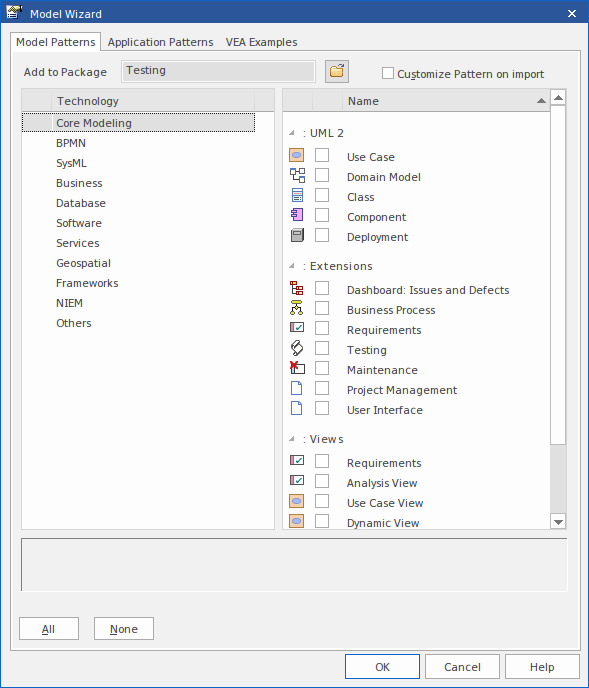 If you are a Technology Developer you can create and import your own MDG Technology, and distribute one or more custom Model Patterns from that technology through the Model Wizard; the name of your technology (or technology categories) displays in this list for your users to select to access the technology Patterns. Lists the groups of Model Patterns provided by the selected technology category, and the Pattern templates within each group.